Experiment 3 with Ayahuasquero in Equador: 50 psychotria viridis leaves per dose, thrice extracted with water and boiled down to 700ml with caapi. I received about 50ml. The potion was far from delectable and we were all give a piece of ginger to kill the taste. This time there was no question that the potion was powerfully entheogenic. Within a hour I experienced vivid visions and synaesthesia, with a pronounced auditory component. Very euphoric and quite powerful dmt effects lasted for some 2 hours, after which I slept easily and soundly. Experiment 13 consisted of 188mg harmine hcl (160mg freebase) (2.0mg/kg) with 40mg dmt freebase (0.5mg/kg) mixed together & ingested as a single pharmahuasca capsule. Indeed, this evoked a proportionally stronger dmt effect with first signs evident only 20 minutes after ingesting and the peak attained at 1:30, maintaining a plateau until 2:40, with clearly diminishing effects at the 3 hour point, and no effects at all by the fourth hour. This was a 3 on a scale of 1 to 5, representing a "mild trip." Experiment 20 consisted of 188mg harmine hcl (160mg freebase) (2.0mg/kg) with 50mg dmt freebase (0.63mg/kg) mixed together & ingested as a single gelatin pharmahuasca capsule. This was between a "3" and a "4" on a scale of 1 to 5. It was between a mild and moderately strong trip. Experiment 21 consisted of 188mg harmine hcl (160mg freebase) (2.0mg/kg) with 60mg dmt freebase (0.75mg/kg) mixed together & ingested as a single gelatin pharmahuasca capsule. This represented a "4" on a scale of 1 to 5. It was a moderately-strong trip. His book is rare to find and retails for over two hundred dollars from book collectors, but read back when it was in print. – 45 minutes to an hour incubation period; the effects quickly building to a peak by 1: 15 and maintaining a plateau for 45 minutes to an hour; followed by about an hour of diminishing effects; the experience usually all but over around the 3 hour point. In no case have I ever experienced nausea in pharmahuasca experiments, although I have weathered nausea and episodes of vomiting provoked by genuine ayahuasca in Amazonia. In any case, I generally eat little or nothing on the day of ingestion. During the experimental series, I always allowed roughly a minimum of a week to elapse between the individual experiments. Modern day researchers, spearheaded by people such as myself, have realized that Jonathan Ott's calculations fall short of what most explorers need for a truly visionary experience. Even with a strong harmine/Banisteriopsis caapi dosage, 30-60mg of dmt is not sufficient to produce significant visionary effects in most people. So if fact, a dosage of 30-40mg of dmt is where tryptamine-like effects just begin to occur for most people, and 10-25mg dmt is not really noticeable above the gentle psychoactive effects of the harmine. Each person is different and for some rare individuals, 30-40mg may be about as much dmt as they wish to take--but most people need at least 60-80mg for sufficient psychoactive effects and even at this dosage, you generally cannot expect a full-blown visionary experience, even when using a strong dose of 4 grams of syrian rue or 100 grams of strong caapi vine. Also, it should be pointed out that going beyond 4 grams of syrian rue (around 200-280mg of harmaline) or 100 grams of strong caapi vine (150--250mg of harmine) can increase the negative effects of these beta-carbolines--which include a feeling of heaviness, pressure in the head, inability to walk properly, more purging and perhaps more of an emphasis on bodily processes. An oral dosage of 100mg of dmt is where the visionary qualities really begin to occur, for most people say when they are taking 3 grams of syrian rue or 80 grams of strong vine, and in context, 40-60 grams of strong vine is enough to fully mao inhibit most people. I would say to neophyte explorers to tread carefully, and to slowly increase your dmt dosage in increments: perhaps starting at 60mg, going to 100mg, then 150mg. Some people are going to find 100mg of dmt to be exceedingly strong, and it will perhaps give them an experience they did not feel ready for. It came to my attention after an embarrassing number of years, that taking freebase crystal DMT orally was not as potent, colourful, or clear as taking the equivalent amount of DMT in a tea that was brewed from the plant. For many years, I couldn't see how there could be a difference, but after doing some comparisons, it was obvious that the tea was much better, and the experiences resulting from the crystalline extract were inferior. You could take twice or even three times as much DMT crystal as the equivalent in brew, and the experience from the crystal would never be as bright or full as that from the tea. Why could this be? With extracted dmt, with chemicals used it would appear that some dimensions and qualities of the tryptamine molecules are compromised. Also, there is the factor of isolating the alkaloids from the rest of the plant. For example, there are very few people who say that extracted pure mescaline from the cactus is as potent of full bodied compared to when they take the tea made from the cactus flesh. When making a tea from the whole plant, you are extracting the essence of the plant intelligence from its very flesh, not just isolating the alkaloids. In the alchemic method "Spagyrics" developed by Paracelsus, often considered the father of modern medicine, the ashes of the plant are commonly burnt and then blended back into an alcohol-extracted tincture. Friends who have experimented with this procedure report that a Spagyric tincture of Ayahuasca is much more potent than a normal tea prepared from the same amount of Ayahuasca vine. THH in the caapi seems to strongly activate the right hand hemisphere of the brain-- the side that performs tasks that have to do with creativity and the arts, feelings, visualizations, imagination, holistic thinking & intuition, empathy, spirituality & connectedness. In the book "Return to the Brain of Eden", researchers found that the right side of the brain lit up in brain scans of people who took LSD, mescaline, or mushrooms. The world is largely moving in the direction of the Left Brain: technology and science. What the world needs is to move in the direction of Right Brain development. 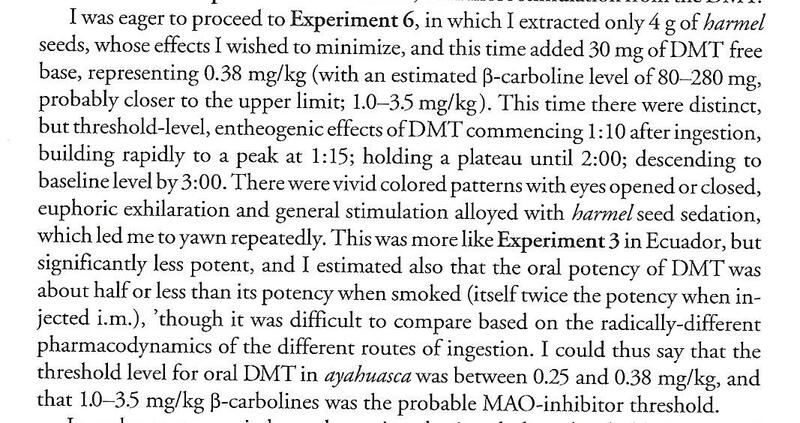 Quote from TIHKAL by Dr. Shulgin "More studies on tetrahydroharmine are absolutely imperative." As to how the THH altered the experience -> I find rue extract+DMT to be very similar to mushrooms. I found the THH added to the rue+DMT to shift the experience to a state much closer to that provided by LSD. It was more clear, more energetic, more euphoric, more focused, and when confusion struck it was definitely more "acid-like". We ought not judge coldly the recreational use of anahuasca -- there are as many paths to a goal, as radii can be drawn from a centre--sensual enjoyment, both with and without drugs, can be a path to self-knowledge and enlightenment. In any case the path to enlightenment is long. Many people who presently employ anahuasca mainly as part of a spiritual quest, cut their teeth decades ago. One of the first lessons to be learned is not to judge others. My focus has ever been on the tools: to put visionary shamanic technology in the hands of peple. It is not my place to judge them, to judge what they do with the tools. But experience wise, for me personally, pharma and teas are very different experiences. Pharma for me was always much less of a boot to the face, easier to handle in alot of ways, and supremely beautiful, if the dose is sufficient and set and setting are conducive. Teas have always been much more thorough, as in the flow the experience takes tends to really sink it's claws in and dig deep, hitting levels within myself that pharma has always seemed to skim (even the earth shattering dosages of pharma). Emotionally and physically, teas have always strung the deeper chords, ime. In many ways, his comments are similar to what Palmer wrote about above. Peace. Edited by tregar, 15 March 2018 - 09:02 AM. Won't go too much into dream experiences with hawaiian psychotria brew and caapi, but suffice to say the over 55 dream experiences over the years have all been quite similar to the visions you read about in "Antipodes of the Mind" the classic Ayahuasca book by Benny Shanon who also enjoyed over 150 dream experiences with caapi + psychotria only. The UDV, Santo Daime, and Shuar Indian also employ traditional caapi + psychotria only (safe, streamlined, nice & traditional with no emotional or physical weirdness, just pure bliss). To sum it all up: what can be seen is infinite in it's beauty. Synopsis of procedure in dreams: blend 25 grams of hawaiian psychotria down to tiny pieces, add to pyrex dish and add 1 and 1/4 bottle spring water, boil for 1/2 hour, filter thru a coffee filter made of fine wires (GoldTone Brand Reusable #4 Cone made of super fine wires), then filter thru a cotton ball stuffed into a large clean automotive funnel (changing out the cotton when it clogs), then take the liquid and reduce it down to 2 to 3oz, add caapi, enjoy dream. The extensive filtering (esp the cotton ball) removes any fine muddy sediment that irritates the intestines for a brew that will not cause nausea to the intestines or stomach, as any irritating particles are removed, this however will not get rid of any "brain nausea" that is caused by using too much leaf, so keep leaf amount moderate (not too strong) to avoid that sort of nausea. Length of dream: 90 minutes of strong activity, that then lowers several notches in intensity for the next hour or so, sleep is easy and peaceful later at night then. What can be seen in visions: beautiful naked dancers twirling in front of slowly turning marble pillars, beautifully decorated elephants from India, Egyptian palaces, remote waterfalls on distant islands, all is seen as if newly created and beautiful, words do not even begin to describe the high resolution, color and detail, and immaculate beauty seen with eyes closed or open, and of course music sounds very heavenly and all senses are magnified. Edited by tregar, 17 March 2018 - 09:59 AM. From page 416 "Antipodes of the Mind". These are some of the most commonly seen various content items (the core corpus) that Benny Shannon found that he himself and hundreds of interviewers saw with closed eyes on the Caapi/harmala brews: The use of these plants span many thousands of years of history, back to a time where it was once consumed and revered for its ability to bring someone into contact with spiritual realities, the obtaining of secret inner knowledge, and visionary experiences of a divine world. Attached: From Ayahuasca artist Pablo Amaringo "The Shaman, the Visions". Edited by tregar, 18 March 2018 - 08:51 AM. DR. Naranjo (Chile), DR. Shulgin (USA), and DR. Benny Shanon (psychology professor at Hebrew University) are all 3 famous names associated with the study of the harmalas. DR. Shulgin even made several famous kind comments about Naranjo's work, and Shanon of course references DR. Naranjo extensively in his book "Antipodes of the Mind." published by Oxford University. Another big name is Dr. Callaway who is the father of modern-day Ayahuasca research, along with the great Dennis Mckenna. Callaway, James C. (June 2005). "Various alkaloid profiles in decoctions of Banisteriopsis caapi" (PDF). Journal of Psychoactive Drugs. 37 (2): 151–5. doi:10.1080/02791072.2005.10399796. ISSN 0279-1072. PMID 16149328. Retrieved 2012-08-10. Callaway, James C.; McKenna, Dennis; Grob, Charles S.; et al. (June 1999). "Pharmacokinetics of hoasca alkaloids in healthy humans". Journal of Ethnopharmacology. 65 (3): 243–56. doi:10.1016/S0378-874100168-8. ISSN 0279-1072. PMID 10404423. Lastly, there are places of entertainment. These seem to fall into two main subtypes. One is that of places such as bars and cabarets, often lascivious and somewhat lewd. The other may be characterized as ludic. The frequency of facilities pertaining to amusement parks in the visions is, it seems to me, disproportionately high. Especially noted are carousels and Ferris wheels. Interestingly, a merry-go-round is also mentioned by Naranjo (1973a) in his experimental study of harmaline. I too can relate, I've seen a carousel made out of galloping horses melt to the ground while going round and 'round then saw it built back up from the groud up, all in beautiful color, and animated. Don't forget that Ott reported in his writings that he was a low mao subtype, most would need a bit more of the harmalas. p.s. Read a report from a poster from years back who in dreams swallowed an Ayahuasca capsule, followed by 1/2 can or 4oz of warmed up soda (to about the warmness of a hot cup of tea or coffee) reported better digestion & increased strength and boot to the system due to the phosphoric acid in the soda + heat of beverage allowing for a better absorption/digestion of the capsule in the system when hitting the 0.5% or less hcl filled stomach. The poster reported only using that method from there on after the discovery.